Requirements were REVISED effective January 1, 2009. (New pamphlet issued August 1, 2008). Tell how three different kinds of potter's wheels work. Make a slab pot, a coil pot, and a pinch pot. Make a human or animal figurine or decorative sculpture. Throw a functional form on a potter's wheel. Help to fire a kiln. Visit the kiln yard at a local college or other craft school. Learn how the different kinds of kilns work, including low-fire electric, gas or propane high-fire, wood or salt/soda, and raku. Visit a museum, art exhibit, art gallery, artists' co-op, or artist's studio that features pottery. After your visit, share with your counselor what you have learned. 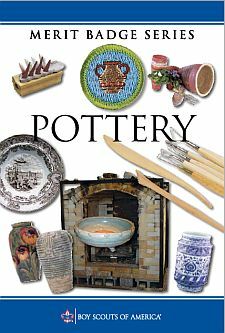 Using resources from the library, magazines, the Internet (with your parent's permission), and other outlets, learn about the historical and cultural importance of pottery. Share what you discover with your counselor.